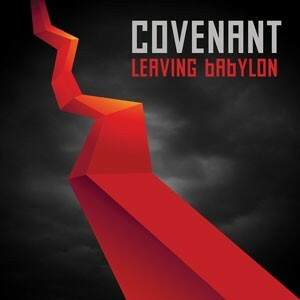 The forerunning single “Last Dance” has not budged from the top position of the German Alternative Charts when Covenant announces the new album Leaving Babylon to be released on September 6th. Built around a structure of majestic synths, quirky noises, unexpected harmonies, scary singing machines and fog horns, massive beats and Eskil’s signature vocals, the singles dark and atmospheric vibe sets the tone for the overall feel of the album. Balancing a return to their early EBM roots with their modern electronic soundscapes, Covenant digs deep into their history and incorporates threads from each of their early releases and weaves it into Leaving Babylon. “The stars shines so bright when it’s dark” says Eskil Simonsson, the bands singer and front man, about the feel of the new album and the troubled world in which we find ourselves. From the industrial shimmer of the opening title track to the midnight dancefloor beats of "Prime Movers" and emotional heft of "Ignorance and Bliss ", this album shows the band expanding the range of their sound while creating a new chapter for their already storied career. Club songs and experimental numbers will cause listeners’ ears to pick up the sporadic guitar chords of “I Walk Slow”, the harpsichord in the intro “Thy Kingdom Come” and the piano in the closing ballad “Not to Be Here“. These are just some examples that prove that Covenant continues to develop their talents in arrangement. With every album they continue to build up their own electronic pop monument, and with Leaving Babylon, they seem to found just the right balance of the accessible and the experimental. The cover shows a stylized tower as a polygon, reaching into the sky before a stormy background. “Signal to Noise” is the phenomenon of communication making random noise out of a signal, wherein the original information gets lost. Hence, one theme of the album is about the pervasive acceleration of communication, which holds society in its grasp and for the order of knowledge. This historically began earlier and has now entered a new stage in the age of internet-assisted data processing: “The floor collapses as we dance”. The album is available as a limited version of 5000 copies. Included with the eight-panel glossy digipak are an extra booklet and an exclusive bonus CD featuring Swedish poetess Helena Österlund.